At Allpro Contracting, our Southwest Chicago remodeling contractors are here to help you and your family enjoy your residence to the utmost. If you have been thinking of ways to improve the exterior of your home, you should consider constructing a custom deck. Our highly skilled professionals are adept at designing, constructing, maintaining, and repairing outdoor decks in Southwest Chicago. With our help, you will be able to achieve all of your goals. Since 1962, Allpro Contracting has been providing the highest quality remodeling services to local residents and businesses. We have been so successful for so long for one simple reason. In every service that we provide, our team works its hardest to achieve the highest level of customer satisfaction possible. Our Southwest Chicago deck building experts experts will bring this dedication to excellence to task for you during your deck construction project. Call Allpro Contracting today if you have been considering constructing a deck around your Southwest Chicago home or business. Our courteous and polite staff would be happy to discuss your prospective project with you. We can answer any of your questions about our skills and services. Our team can schedule your appointment today. Our Southwest Chicago deck builders are here to help you with every aspect of your deck construction project. 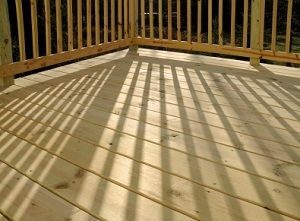 We can personally inspect your property in order to help you determine the best layout of your prospective deck. Our professionals can then inquire as to your unique goals. With this information, our experts can provide you with deck design and construction services that produce a finished product that is perfect for you and your family. Your deck will be a great place for you and your family to gather together after a long day at work and school. It can also be used for entertaining guests and friends. Each and every moment that you spend in the area will be absolutely amazing. Our professionals would be honored to provide you with the deck of your dreams. After our professionals construct your deck, we will always be available to keep it in the best condition possible at all times. Our Southwest Chicago remodeling contractors specialize in deck refinishing and repair services. Through a deck refinishing project, you can restore an old, dingy, and unsightly deck to its original beauty. With our help in repairs, you can add many years of value and enjoyment to your existing deck. Our professionals would be honored to assist you with either effort. If you would like an estimate for deck building in Southwest Chicago, please call 708-658-3500 or complete our online request form.